Meet the World was one of the few attractions unique to Tokyo Disneyland. It opened with the park in 1983, and closed in 2002. Although it could never have won a popularity contest, it was still one of my favorite places to visit. Back when Tokyo Disneyland was still using ride tickets it was one of the only free attractions in the park. Your guide was an animated talking crane who lead two curious children on the time-travel journey, complete with representations of prominent Japanese and Western figures from the history books. Filmed sequences played an extensive role in the Meet the World presentation, with Audio-Animatronic characters appearing at key moments during the story to help recreate a particular event. The dialog was in Japanese (although characters from other countries spoke in their native languages); however, there were headphones in the back row where you could listen to an English or Chinese translation. When I used to tell my Japanese friends that Meet The World was one of my favorites, they usually gave me a puzzled look. I can't really put my finger on the source of my affection for the attraction; I guess I just loved the uniqueness of it. One thing I can say for certain is that I loved its theme song, which was written by the legendary Richard & Robert Sherman (who also wrote It's a Small World, the scores for Mary Poppins and Chitty Chitty Bang Bang, and countless other classics). 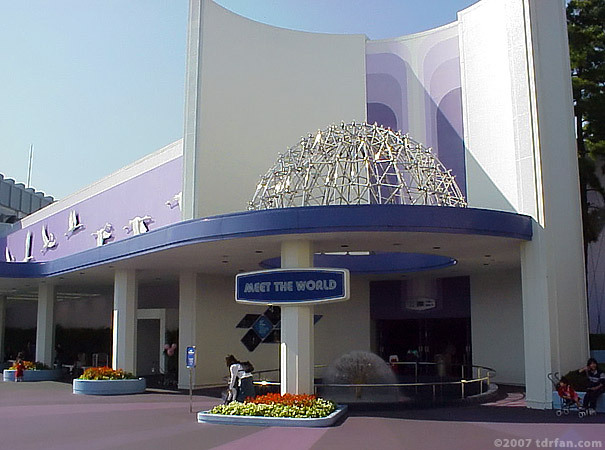 Postscript: After its closing as an attraction, the Meet the World building served on and off as a guest-services area for several years. It was finally demolished in 2006 to make way for a new attraction based on the Disney movie Monsters, Inc.